advances in hydrometeorological research (HMR). analysis of high-end simulations, and to support the dissemination of predictive models as decision analysis tools. activities will deploy the end-to-end DRIHM services and tools in support of HMR networks and virtual organizations on top of the existing European e-Infrastructures. •The establishment of HMR e-Science support centres and corresponding training activities to attract a broad end-user audience comprising of scientists and non-specialists including relevant European Strategy Forum on Research Infrastructures (ESFRI) communities. infrastructure and development of new working practices in the DRIHM e-Science environment. •Experiment Suite 3 —Water Level, Flow and Impact: Execution of hydraulic model compositions in different modes to assess the water levels, flow and impact created by the flood events. Indeed, this process can be driven from data produced by experiment suite 2. Networking activities: A series of Networking Activities (NA) are designed to facilitate the cooperation between the project partners and within/between the HMR and the Earth science as well the ICT related communities, all together constituting the DRIHM Virtual Community and benefiting from the augmented research infrastructure. NA1 will provide the managerial structure and the procedures to ensure effective and successful work of the project as a whole. Over the entire term of the project NA2 coordinates the dissemination and outreaches of the work performed in the Service Activities (SA) and the Joint Research Activities (JRA) in general. While NA2 focuses on the dissemination of results, NA3 will emphasize the support, training and education aspects. NA4 addresses the definition of policies to set up and manage the DRIHM virtual community and the long-term vision by promoting sustainability. from the Joint Research Activities for the prioritization, creation and integration of innovative services, devoted to empower the vertical dimension of the e-Infrastructure and improve the support to the HMR community. Joint Research activities: DRIHM Joint Research Activities (JRAs) are focused on the provision of innovative e-science solutions for making HMR community and neighbouring earth science disciplines benefiting from Grid and HPC services. In this respect, JRAs are organized in two work packages. JRA1 is about e-Infrastructure solutions to integrate HMR models, tools and datasets into DRIHM e-Infrastructure. A set of meteorological, hydrological and hydraulics models, as well as stochastic downscaling and nowcasting tools, will be adapted for the parallel and distributed supercomputing systems available in the participating HPC/Grid centres. JRA2 will setup three HMR experiment suites that will permit to assess the quality of provided service and point out the necessity of new services and their required characteristics. User communities: the DRIHM e-Science environment user population will be broader than just specialist scientist users, also including members of public services (e.g. operational hydrometeorological centres) and interested members of the general public. International aspects: Leading HMR and IC initiatives/Institutions, such as HyMeX (HYdrological cycle in the Mediterranean Experiment), MAP D-PHASE (MAP Forecast Demonstration Project), MEDEX (MEDiterranean Experiment) projects, EGI (European Grid Initiative), OGC (Open Geospatial Consortium), CSDMS (Community Surface Dynamics Modelling System), and WMO (World Meteorological Organization) have already expressed interest in collaborating with DRIHM activities. 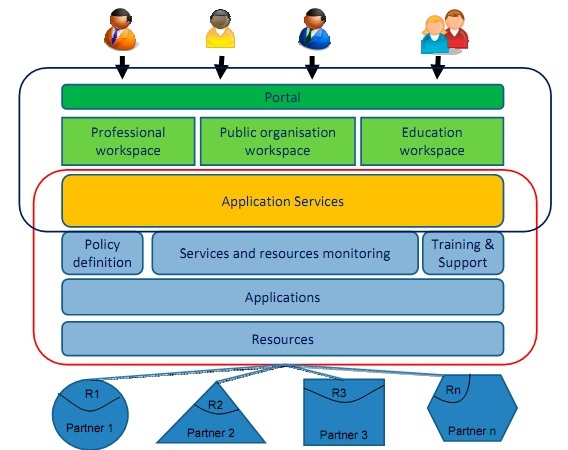 The conceptual view of an e-Science HMR environment is depicted in the Figure below, where resources (e.g., hardware, design and simulation methods and tools) are provided by various institutions, services are aiming at organizing the use of resources and applications, and application services are accessible via portals. Data Access services: including dedicated services, such as the CUAHSI HIS for time series data and the Thematic Real-time Environmental Distributed Data Services (THREDDS) for accessing dynamic grid data corresponding to severe hydrometeorological events into an HMR e-Science environment data repository and needed for calibration, validation, or evaluation of the suitability of different modeling tools. The e-Science conceptual view leads to the following architectural view over a Grid infrastructure, as depicted in the Figure. It is organized by the well-known layer pattern for implementing the inevitable separation of concerns. The Resource Layer contains all physical resources (computing elements, storage elements, instrument elements, sensor networks, communication networks) which are provided by the various partners in the HMR e-Science environment. Typically, these resources are provided over European e-infrastructures like DEISA, PRACE, EGI or the national NGIs, but operated locally by the providers. For accessing them a Grid middleware system like the Globus Toolkit, gLite, or UNICORE is required. Some of the resources may also be available in a Cloud (public or private). The middleware and the access services are part of the Infrastructure and Middleware Layer. In order to cope with the inherent heterogeneity of Grid resources and Grid middleware, an Interoperability Layer assists in transparently accessing the resources via the underlying layers. The interoperability layer is based on standards like those defined in theOpen Grid Forum (OGF), or in the Organization for the Advancement of Structured Information Standards (OASIS) like the Security Assertion Markup Language (SAML). The HMR related services are comprised in the Service Layer which itself is separated in the Basic Service Layer and the Compound Service Layer. The Service Layer typically interacts with the Interoperability Layer to transparently access the HMR resources. However, it may also interact with the Middleware Layer directly.On top of the Service Layer, the Application Layercontains the specific HMR applications for simulations, experiments and e-Learning. 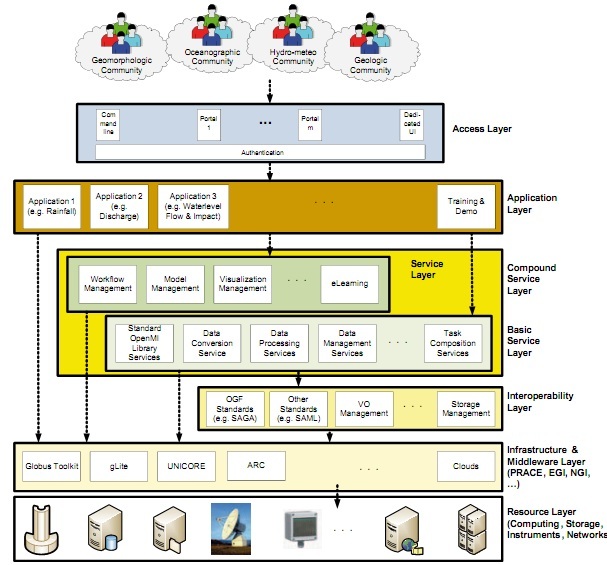 The Application Layer uses (basic or compound) services from the Service Layer. It may, however, also interact directly with the Grid infrastructure. As opposed to the Basic Service Layer, the Compound Service Layer provides more complex services assembled from basic services. Typical examples in the HMR context are the creation and the management of workflows, the management of model sets, or the visualization of simulation results. The Application Layer is accessed via the Access Layer which provides the required capabilities to authorize the access to the HMR applications via various portals or clients and through an authentication interface.